My mother has always enjoyed and excelled at all kinds of handwork. She sewed, knitted, crocheted, and in the seventies, she even did some groovy macramé. 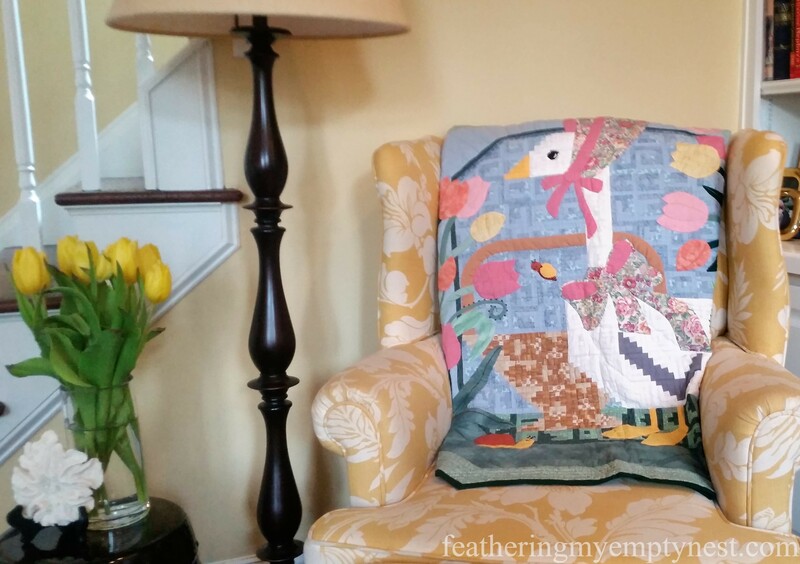 In the early 90’s around the time her first grandchild was born, she became a quilter. She was particularly suited to this handcraft because it requires an artful eye and the careful precision with which she approached every task she ever undertook. After my grandmother passed away, my mother found a quilt top among her mother’s belongings. My grandmother and great-grandmother had pieced it but had not gotten around to quilting it. Mom thought that it would be really special if she and her daughters could finish this vintage family quilt together. Unfortunately, while we did learn many things about homemaking from my mother, none of us were particularly interested or proficient at handwork. However, we did not want to disappoint my mom, so we agreed to give it a go. As my sisters, mother and I sat around the quilt, I struggled to make small and even stitches, not wanting to screw up this precious family heirloom. After we had quilted for a couple of hours, we decided to take a break and have a snack. When I started to stand up, to my horror, I realized that I had stitched the quilt to my skirt! At that point, Mom had to concede that I was not going to follow in her footsteps as a quilter. She reluctantly finished that vintage quilt by herself and went on to make dozens of other beautiful quilts, creating gorgeous handmade keepsakes for all of her children, grandchildren, and great-grandchildren. My talented mother turned 80 this year, so my sisters and I decided to throw her a quilt-themed party to celebrate her birthday and to honor her legacy of quilts. One of my sisters, who used to be a graphic designer, created an invitation and we asked everyone to bring their Mom-made quilts to display at the party. I displayed this stunning red and green Baltimore Album Quilt my mother made for me by hanging it from banister overlooking my foyer so that the guests would see it when they entered the house. 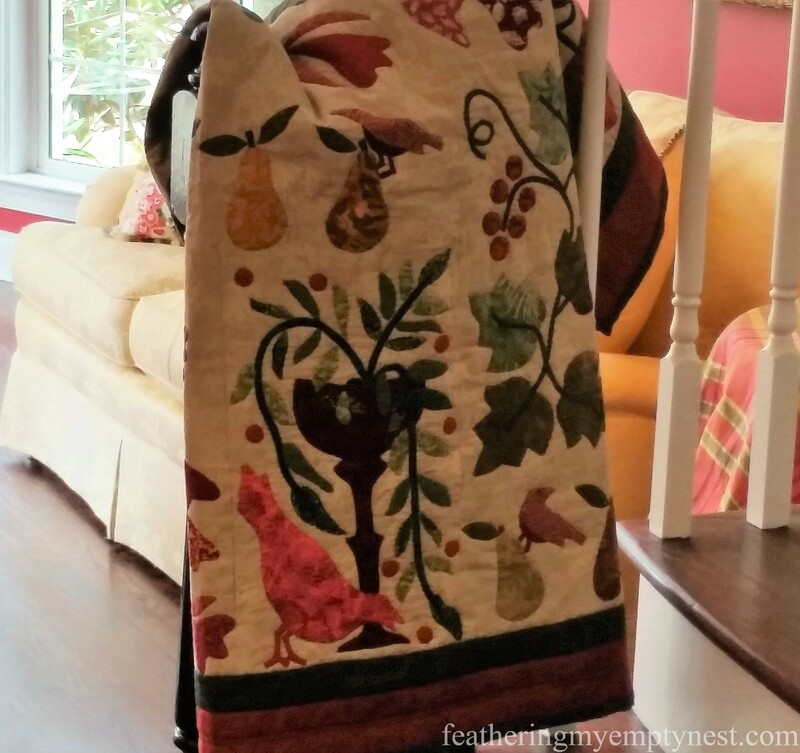 My mother made this beautiful applique quilt that features birds and fruit for my sister. This incredibly intricate Mother Goose’s Garden quilt was made for my eldest daughter because her childhood bedroom had a Nursery Rhyme garden theme. 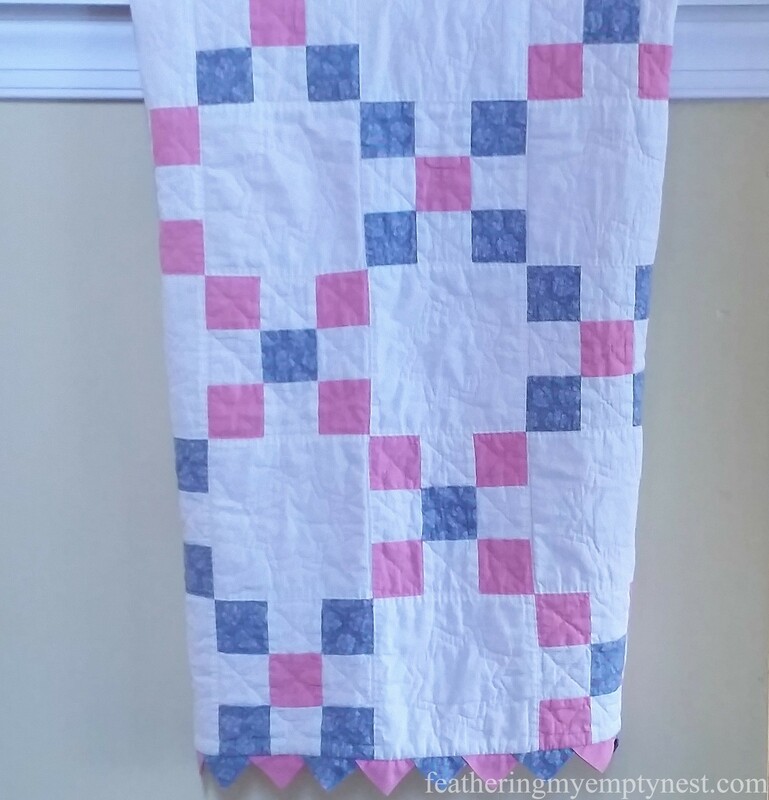 This traditional patchwork quilt was one of my mother’s early quilts, made for my youngest daughter as a baby gift. I then set about creating theme-appropriate decorations for the party. The first thing I made was this embroidery hoop and quilt square wreath for the front door. I ordered the hoops from Amazon and, since we know I don’t quilt, I ordered the Dresden Plate quilt blocks from PokeSallet on Etsy. I used a glue gun to adhere 3-inch embroidery hoops to the large 14-inch hoop to make this wreath for the front door. I decided to use wooden spools in a variety of ways to further the theme. 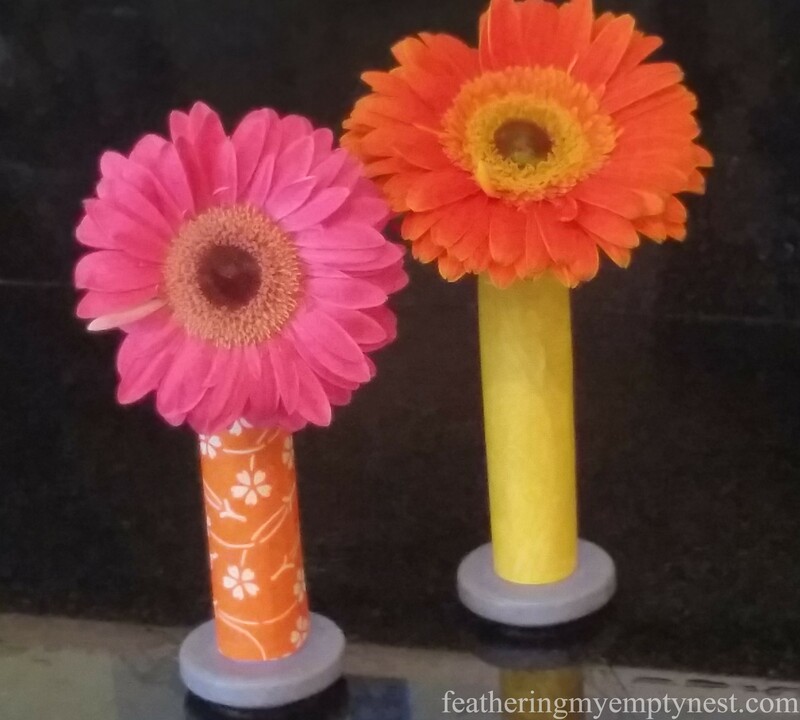 To make them colorful, I glued patterned origami paper to each spool. 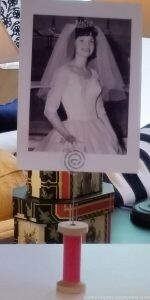 I strung about two dozen of these on a ribbon and festooned the area above the buffet with this quirky spool garland. I glued wire card holders to the inside of some taller thinner spools to make photo stands. I made copies of pictures of my mother throughout her life and displayed them on the buffet. I also found some antique industrial spools that I decided to use as bud vases. 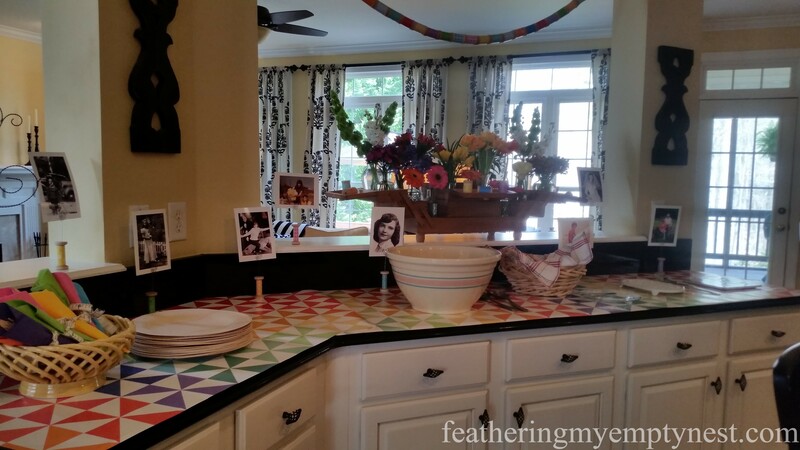 Rainbow Pinwheel quilt patterned wrapping paper from Spoonflower covers the counter we utilized as a buffet. 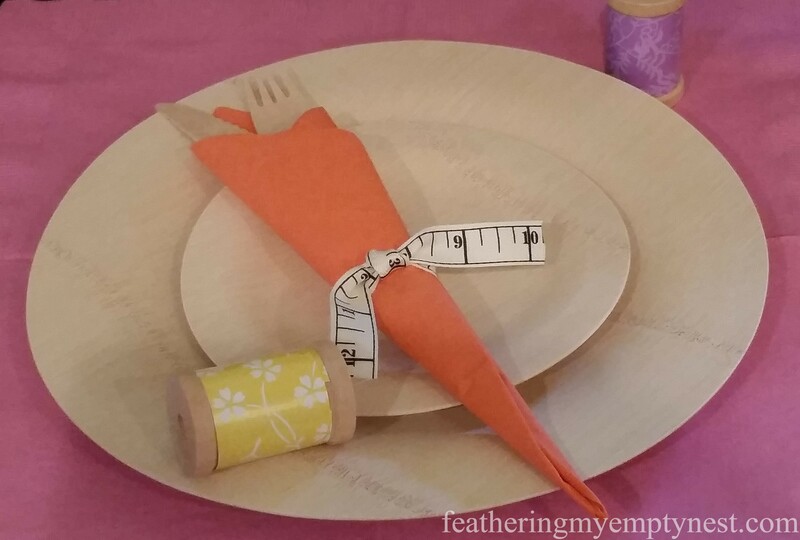 I used disposable wooden bamboo plates and cutlery to coordinate with the wooden spools. 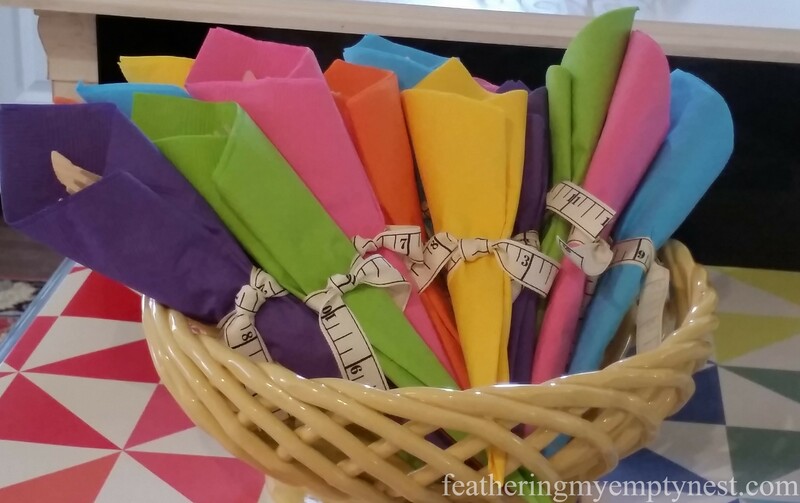 And I wrapped the forks and knives in colorful napkins tied together with measuring tape ribbon. 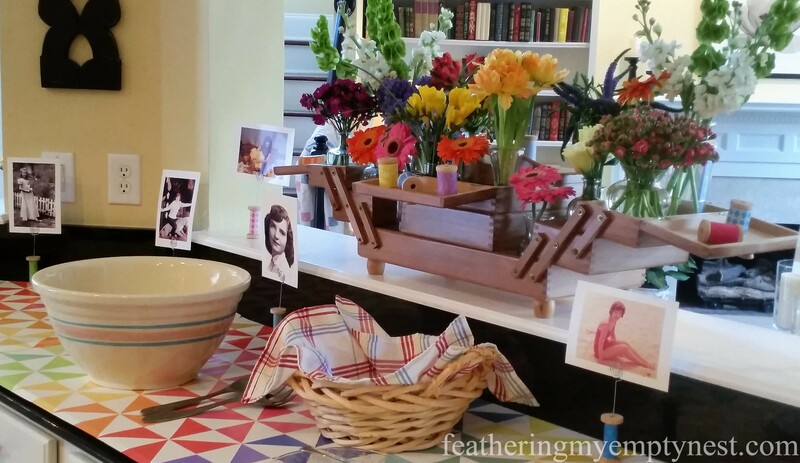 I wanted to make a sewing-themed flower arrangement for the buffet, so I used a wooden sewing box that my mother had given me years ago when I was making a lot of draperies and pillows for my home. The box opens up and has all kinds of compartments, and I thought that it would be interesting to fill each of the areas with bud vases that would contain a different flower. 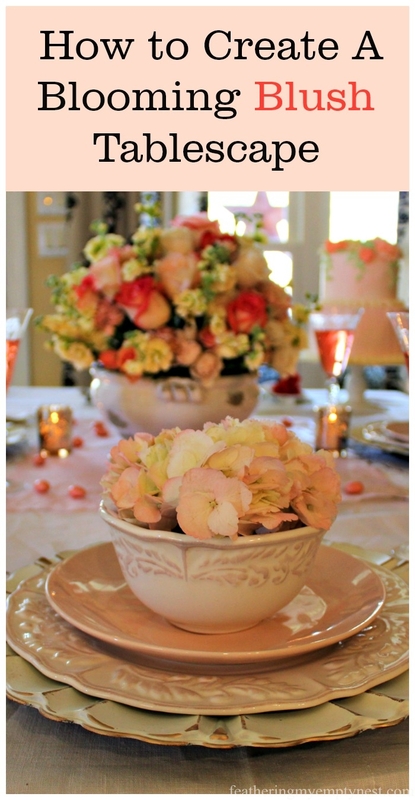 A fold out wooden sewing box with clear glass bud vases filled with an array of colorful flowers is the centerpiece for the buffet. 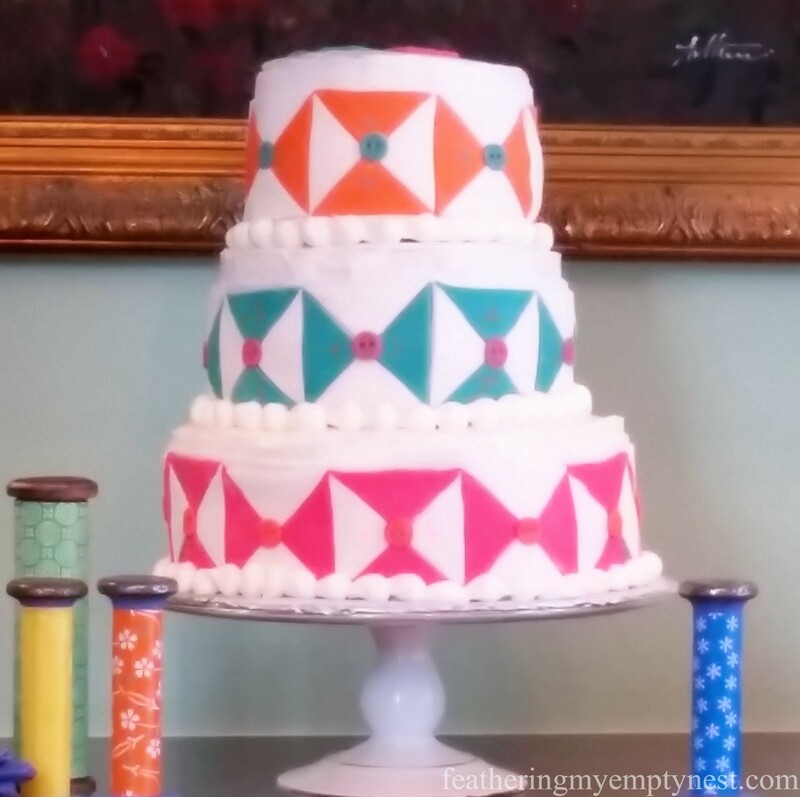 Of course, the cake also had to have a quilt theme. I knew I wanted to use fondant because it could be cut into exact shapes. I never used fondant before, and I don’t particularly like its taste or consistency, so I did not want to cover the whole cake with the stuff. I iced the cake with buttercream and then attempted to apply fondant to the sides of each tier. This technique met with limited success as the weight of the fondant caused the sides of the cake to kind of slump down in places. Overall the Buttons and Bows quilt pattern worked pretty well, and I don’t think any of the guests noticed that it was a bit lopsided or that the placard was not intentional, but being my mother’s daughter, I was not pleased by the lack of precision. Three tiered Button and Bows quilt cake flanked by spools and baby quilts made for my niece and nephew. 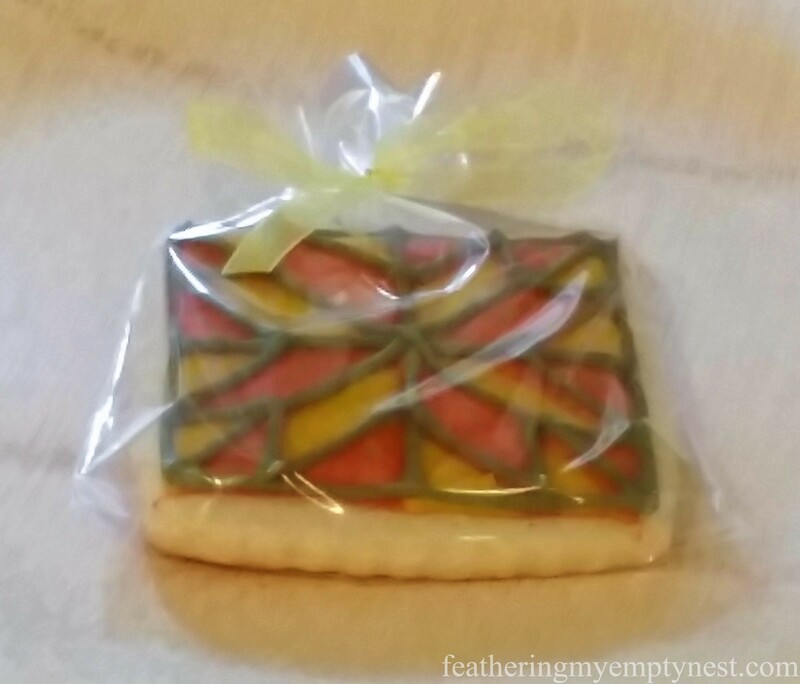 One of my sisters made these perfectly decorated quilt square sugar cookies which we gave as a favor to all the guests. 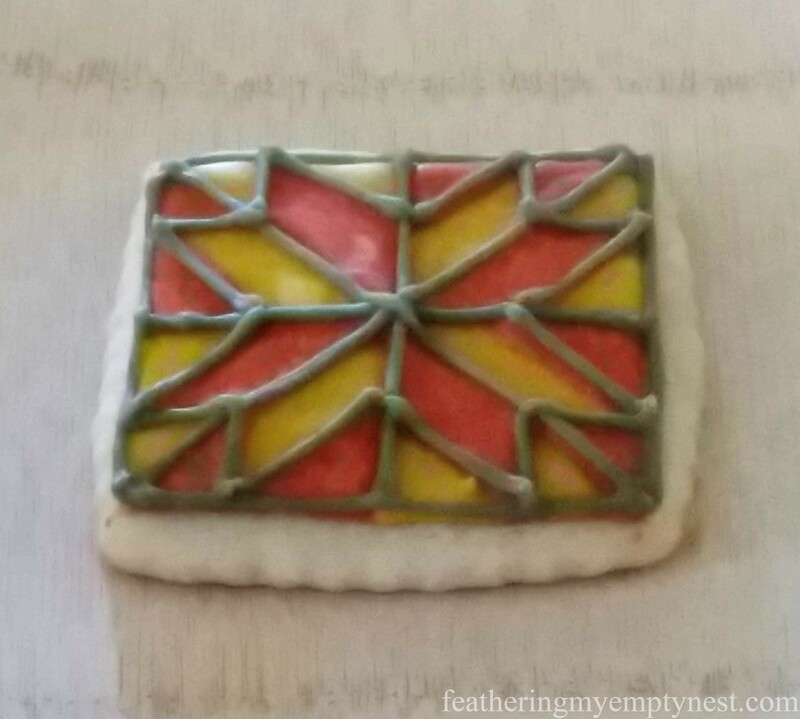 Quilt themed sugar cookies that my sister and niece painstakingly created to give as favors. As an activity, we provided paper templates and asked the guests to color their own decorated quilt square with a personalized message for my mother. We will “sew” the squares together and present it to Mom as a group card from the attendees. I hosted the party, but all three of my sisters and my daughters contributed to the event by providing food, beverages, flower arrangements for the tables, and a great deal of help setting up and putting the cake together. This event was truly a group effort for our mother/grandmother who taught us so many lessons and gave us the incalculable gift of her love and affection. I know that my mother was disappointed that I did not have the ability to be a quilter, but I would remind her that she did not start quilting until she was a grandmother. So, maybe there is hope for me yet–as long as I keep the material away from my skirt. Thank you to all my daughters and granddaughters! It was a fantastic party! I am so very blessed. Your mom has given you and future generations a great gift. Not only are the quilts beautiful, they will be passed down for many generations. I can imagine your mom really appreciated the theme of the party – it shows how much her efforts mean to you and your 3 sisters. I wish I was there when you stood up to discover you sewed the quilt to your skirt. I can imagine you, your mom, and your sisters laughing uncontrollably for hours. I was so happy to be a part of this celebration. 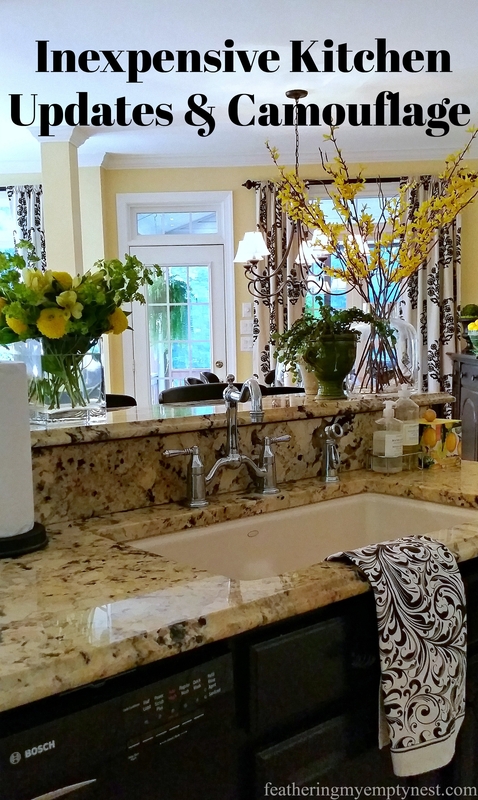 Lisa is known in our family as the one who has most closely followed our mother’s tradition of fabulous entertaining, and she did not disappoint! Wow! I love the sewing box arrangement! 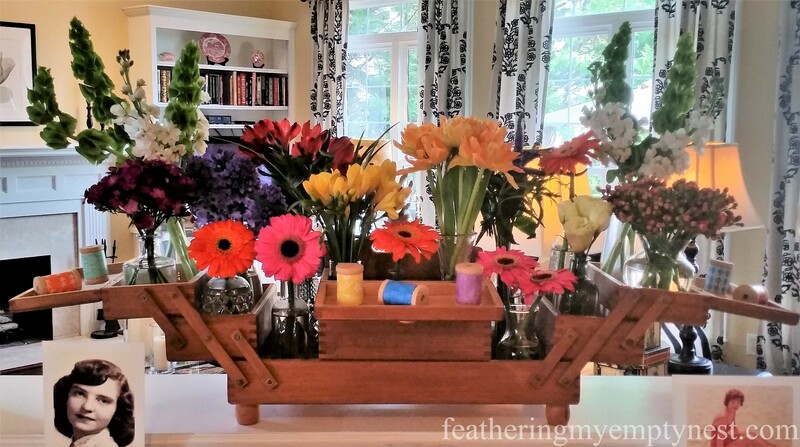 Thank you so much for your comment on my sewing box floral arrangement. What a unique party. So much talent here. Thank you for checking out my Quilt Party post. Thank you so much for your kind words about my post. It was a fun party. This is amazing. I am inspired with your decorations! 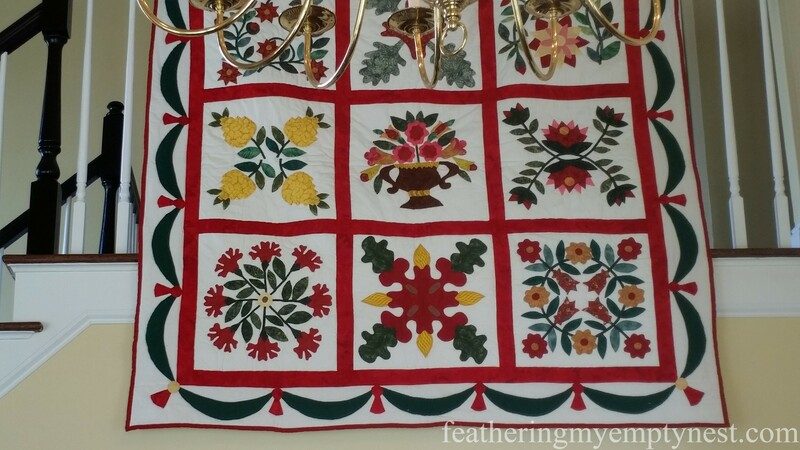 Thank you so much for visiting my blog and for your kind words about my quilt party decorations. What a great way to honor crafty mom. Thought the story of you sewing the quilt to your skirt was great. I am sure I would have done the same thing. I have quilts made by my grandmother and my husbands aunt both of whom have passed away. Quilting seems like a nice way to have some piece of them to keep with you. Thank you for your comment on my Quilt Party post. You are so right that having quilts or other items that the women in our families made by their own hands is a precious connection to them and to the past. They are definitely things to be treasured and passed on to the next generation. What a most beautiful Birthday party for you mom! She is definitely a most remarkable talented quilter!…Had to laugh about sewing the quilt to your skirt as I have done that! Your party reminds me of the Wedding Shower I gave for my daughter in law years ago. She loves quilts and I made it a quilt theme! 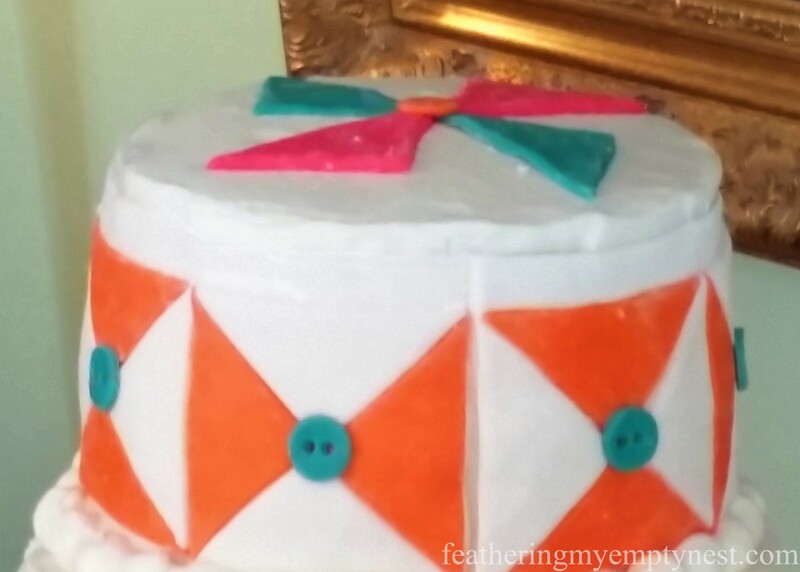 The cake was a sewing box made by a talented cake and pastry chef in our town. The cookies too made by the pastry chef were also quilt patterns and butterflies hanging on a metal tree….all tablecloths were quilts….My gift to her was a beautiful Lane cedar chest draped with a quilt and the gifts were placed in the chest….This party for your mom brings back memories. Happy 80th to your Mom!!! P.S. 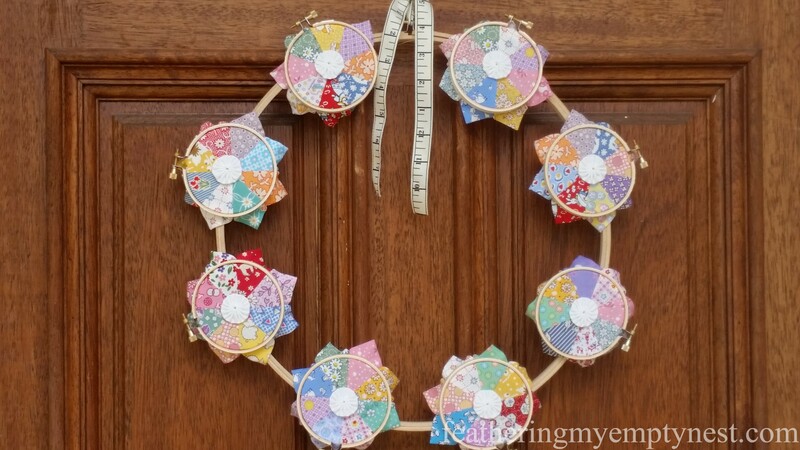 Love your hoop wreath! Great idea! Thanks so much. It sounds like the quilt-themed shower you threw your daughter-in-law was quite fabulous as well. The Lane cedar chest was an inspired idea as a gift because if she is a prolific quilter like my mom, she can definitely use a place to store all the quilts she has no room to display. I enjoyed reading your blog about quilt themed birthday party for your mother. She was thrilled with her party and seeing all her family. You had some very clever decorations. And she had a wonderful time. Angela, Thank you so much for taking the time to comment on my blog. It was a fun party and I was so happy to be able to do it for Mom. What a great idea to honor your mother! What a fabulous celebration, so much time was involed and it is beautiful, I love the use of the sewing box for the floral display, perfect!! Thank you so much. It was a fun a fun party. I think my mom really enjoyed it. Thank you also for hosting Friday Features. That’s a great story…stitching the quilt to your skirt sounds like something I would do. 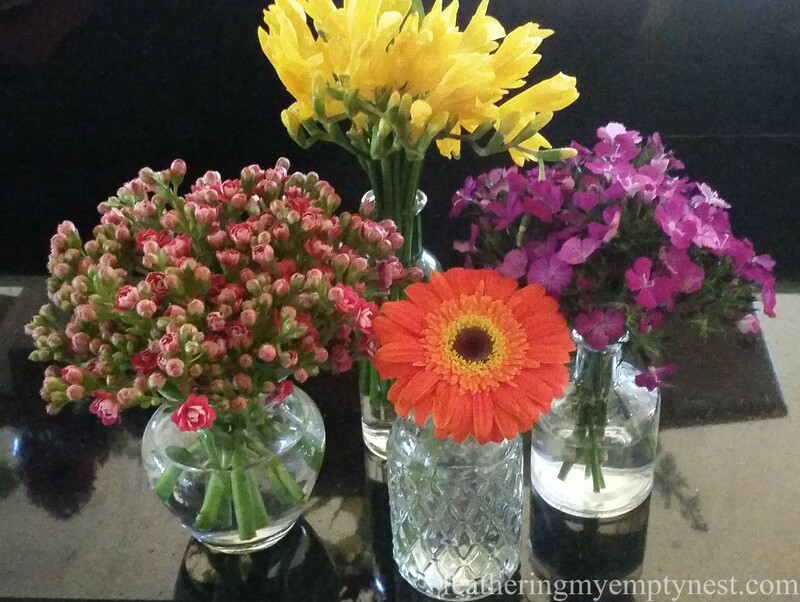 Thank you for your kind comment on my post and thank you for hosting the Funtastic Friday Party.